New York: Wall Street closed its best month in 20 years on a down note on Monday as the failure of trading firm MF Global Holdings Ltd and new worries about Europe’s debt crisis hammered financial shares. MF Global Holdings Ltd, the futures broker that made big bets on European sovereign debt, filed for US Chapter 11 bankruptcy protection, making it the biggest US casualty of the euro-zone crisis. Trading in MF Global shares was halted. Financial shares fell sharply. Morgan Stanley, which has tended to do poorly when fears about Europe rise, dropped 8.6% to $17.64. Monday’s losses marked a reversal of last week’s euphoria over European leaders’ deal to contain the debt crisis. “We started the day with more questions about the European Union," said Mark Grant, Southwest Securities managing director, in Fort Lauderdale, Florida. “Serious questions were raised, and then MF Global came along. MF is involved in all kinds of markets, and the fallout from them going bankrupt is unknown." As the sell-off accelerated at the market’s close, the CBOE volatility index jumped 22.1%, its biggest daily gain since mid-August. News late in the day that Greece called an unexpected referendum on a new EU aid package baffled investors and added to the uncertainty. “It struck me as a very curious protocol and I will be interested in how the Asian markets react to that tonight," said Fred Dickson, chief market strategist at D.A. Davidson & Co. in Lake Oswego, Oregon. Contributing to the downward pressure, the US dollar shot up to a three-month high against the yen as Japan’s government intervened to curb its currency’s appreciation, which hurt the export-based economy. The dollar’s jump caused shares of energy and natural resources companies to fall sharply. The S&P energy index fell 4.4% and was the worst-hit sector. Despite the declines, the benchmark S&P 500 index was up nearly 11% for the month and posted its best monthly percentage gain since December 1991. Most of that run came as European leaders moved to beef up the region’s bailout fund and recapitalize its banks. But despite October’s gains, the S&P 500 index is flat for the year so far. Still, many analysts believe that with a worst-case scenario in Europe seemingly off the table -- at least for now -- stocks could gain further as investors turn their attention to stronger-than-expected economic data in the United States and China. The Dow Jones industrial average dropped 276.10 points, or 2.26%, to 11,955.01. 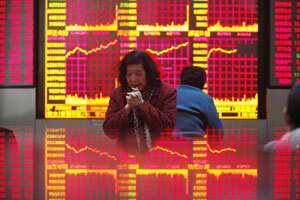 The Standard & Poor’s 500 Index fell 31.79 points, or 2.47%, to 1,253.30. The Nasdaq Composite Index lost 52.74 points, or 1.93%, to 2,684.41. Bruce Bittles, chief investment strategist at Robert W. Baird & Co in Nashville, said the market’s strong advance over the past month was leading to some selling, but said the market would likely rise further, provided the S&P 500 held the top end of its recent trading range at around 1,250. “The market had a huge run in October, so the market was overbought coming into today," he said. Bank stocks were among the worst performing, with the KBW bank index down 4.1%, although analysts said MF Global was unlikely to be big enough to spark a systemic failure in the banking sector. JP Morgan Chase, which, according to an MF Global court filing, has about $1.2 billion worth of claims against the brokerage, fell 5.3% to $34.76. The greenback’s advance pressured commodity prices, with copper off 2% and Brent crude down 0.3%. Many commodities are priced in the greenback, making a spike in dollar prices more expensive for traders in other currencies and sapping demand. The S&P materials sector dropped 4.2%. Shares of Freeport-McMoRan Copper & Gold Inc lost 5.9% to $40.26. Aluminum company Alcoa Inc dropped 7% to $10.76. “After a solid month of gains, the (higher) dollar is giving traders a reason to shy from the risk trade and take some profits," said Peter Cardillo, chief market economist at Rockwell Global Capital in New York. Volume was moderate, with about 7.7 billion shares traded on the New York Stock Exchange, NYSE Amex and Nasdaq. Declining stocks outnumbered advancing ones on the NYSE and the Nasdaq by about 4 to 1.